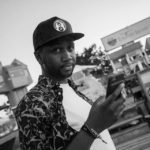 Chicago native and Maybach Music's latest signee, Rockie Fresh has recently added a very appealing twist to the West Coast portion of his Electric Highway tour. He will have Montreal producer/DJ Lunice spin a live set at the end of each show. Lunice, to those of you who weren't aware, is one half of the wildly popular group TNGHT and Diplo's Mad Decent label. Noted for his high-paced, energetic and hip hop-influenced productions, Lunice continues to hold it down for Canadian talent, especially in the hip hop-electronic realm. View the Rockie Fresh Electric Highway Tour trailer below.